Today, May 5, is the 34th anniversary of one of the most memorable stories of the late 20th century. 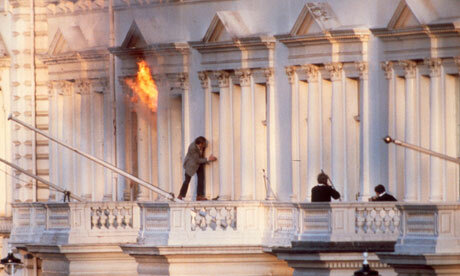 That being the 1980 Iranian Embassy siege in London. I remember the siege quite well. I had just turned 9 a few days earlier but the famous image of the front windows being blown out and dark clad, gas mask wearing people running into the building just stuck in my mind. All of this broadcast, almost, live on TV. The British government tried everything to bring the siege to a peaceful conclusion but, as we know, this didn’t happen. The outcome was broadcast in, at the time, the longest newsflash in television history. This newsflash went on for about 45 minutes. We were kept informed on what was happening at the embassy by a young female reporter who came into her own at the other end of the decade at Tienanmen Square. That being Kate Adie who was reporting the event from hiding behind a car door. In the days leading up to the violent ending of the siege the police tried everything in their psychological handbook to disrupt the terrorists. From organising the cutting of power to the building, changing the flightpath to London Heathrow. One of the best was to get, I think it was British Gas, to do some “maintenance work” nearby so throwing not only lower flying aircraft but the annoyance of pneumatic drills going off all day. Over the years more and more has come out about what happened in government. A lot has been held back because of the Official Secret Act and the “30 year rule”. I’m sure that more will be released over the years when the next block of year rules kick in. I have other vivid memory of the events in early May 1980 This is from the aftermath as I was in London a few months later on a trip to Baden Powell house with the rest of my cub pack. One of the days there we drove past the embassy and saw the fire damage to the front window. The same one that made such dramatic footage a short time before. Over the years we have learnt more and more about what happened inside in the short time that it took the SAS to rescue the hostages and kill, most of, the terrorists. There are still controversial aspects of the operation that are still here today. What happened in the Wireless room is the main area of contention even today. There are also aspects of the siege that showed the sneaky side of the British character. Two BBC employees were at the embassy. Not that unusual as they were there to have their visa applications approved so they can go and cover the revolution that had just happened in the country. They were Sim Harris and Chris Cramer. Chris was taken seriously ill on the 2nd day. It does seem that he did play up how ill he actually was so to be released. This release was one of the best pieces of news that the SAS and police had in the early days of the siege. He could easily, in English, answer all of the questions that were needed that helped plan the operation that ended the siege on May 5. They had already found and talked to the building’s caretaker who told them, ironically, that on SAS advice the embassy should upgrade their ground floor windows and doors to bulletproof glass and a re-enforced steel main door. The terrorists didn’t do themselves many favours as well. It all started when they searched the hostages and didn’t discover that the Policeman on duty at the embassy door was armed throughout the siege. They did do some good things, such as releasing the women over the days as well as a couple of the male hostages. The male hostages, such as Chris Cramer, were released on medical grounds apart form one who was released because he snored so loudly he was annoying the rest of the people in the building. When the raid started it was agreed with all the news agencies at the scene who were broadcasting live to do so on a 10 minute delay so not to tip off the terrorists if they were listening to the radio or watching television. One of the terrorists survived by disguising himself as a hostage and managed to get out of the building. There has been comments made that he was going to be taken back into the building and be “taken care off”. This didn’t happen as they were reminded of the world’s press were there and it wouldn’t have been the best end of the successful mission. It was a different time. There was a new television channel that had just started on American cable. CNN. Here in the UK we didn’t have that. We didn’t even have morning TV. TVAM and BBC Breakfast were still a couple of years away. There were 3 TV channels. Not even Channel 4 had started by then. The BBC did this piece as a wrap-up later on in the day.